realizing that I would benefit from a magnifier for my camera's viewfinder. and it seems to be the solution for me. and allows me a brighter view, but I don't want to use that all the time. large sums of money if I can have satisfaction with a simple but quality magnifier. but I think 1.5X to 2.5X would be better-suited for myself. but I don't think right-angle is the way I need to explore. My eyeglasses are of a current prescription. further away than about 2 feet. Thoughts, ideas, comments are welcome. You have to change the focusing screen to Canon Ef-S/third party split image before adding a magnifier. Otherwise, you can focus precisely even you add a magnifier. 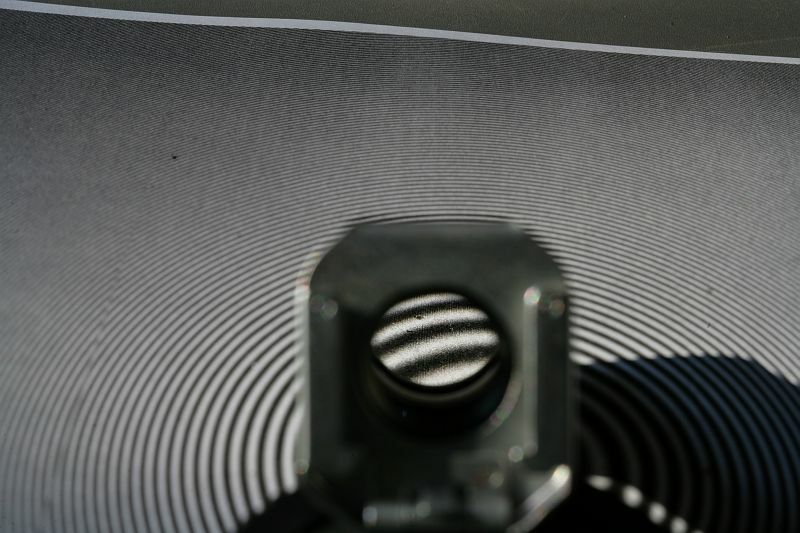 You have to change the focusing screen to Canon Ef-S/third party split image before adding a magnifier. I've already installed a split-circle/microprism screen. to fit over the viewfinder. If you can find one, a Canon Magnifier S may be what you are looking for. Many thanks to you, Edgar! for the princely sum of US$15. 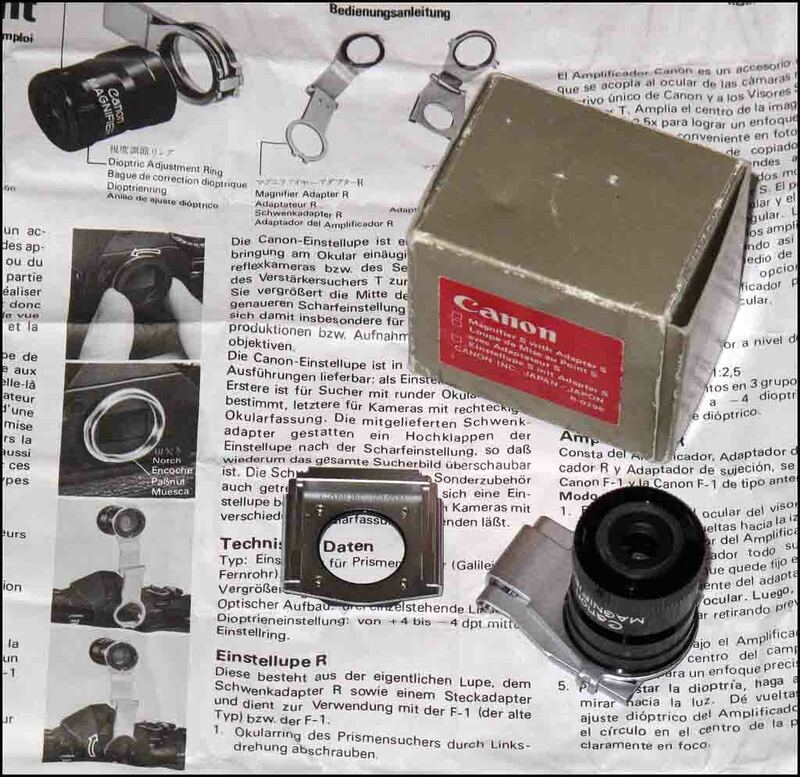 I have the Canon Magnifier R with the S adapter -- or is it the Magnifier S with the R adapter -- I don't recall anymore. It's been so long since I've used it I don't recall anymore how much of the frame is visible with it. Mine makes enough of a difference to matter, so I recommend going with something like this. It's certainly cheap enough. adapter to fit my camera. Should arrive on March 5 or 6. If this proves to be lacking, I'll be looking at alternatives. One thing I discovered about my EOS was that its eyepiece's rectangle was the same size as my A-series and T-series Canons. So if you have the S adapter, it should fit, I'm thinking. The big question will be if you're gonna get enough coverage. I suppose I could dig mine out and test it for you. Maybe I'll do that tomorrow. It's late and I'm typing in bed so it's gonna have to wait until tomorrow. Okay, I dug out my Magnifier R (don't have an adapter S as it turns out), and mounted it to an F-1, which has the round eyepiece. I don't know what the magnification is, probably 2x or 3x -- just guessing. But the downside is only the central area of the frame is visible. Well, you can see the corners but you really have to view things at sharp angles in order to see the corners -- and then you're not viewing what's in the center of the field. So, I really don't think you'll be happy using the Magnifier R or S as a general means of magnifying your field of view. Really, you should give one of those eyepiece magnifiers a try. They work well, especially if you don't have to wear glasses. If you're wearing glasses, then you might not quite be able to see the entire frame all at once. But just a slight angling away from center and you can see the edges. Well, it seems Michael was right. cumbersome to view the shutter speed and exposure information. I'll poke around ebay with Michael's suggestion in mind. Have you looked at right-angle viewers Many have adjustable magnification. Mine is 2x; I can see entire viewfinder. 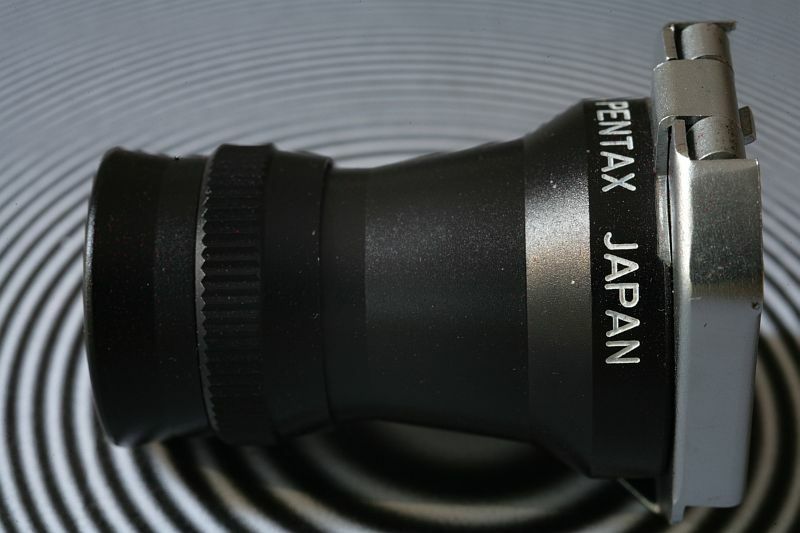 Asahi Pentax viewfinder magnifier for Spotmatics fits my classic Canon 5d perfevt, gives full view. My goto. Yes, I have an Asahi angle viewer, which is bright and displays the entire view, but does not provide a corrected image, with left and right being flipped. Any of the corrected-image angle finders are far costlier than I'm willing to pay, and I'd rather be looking straight into the camera most of the time. There is a newer version of ra viewer which corrects image. excellent condition with original box & case for US $20. extremely poor in materials and quality, as Amazon buyer reviews indicate. of glass elements delaminating, with a review picture to prove it. reception. For some unknown reasons, they cost over $100 US from most sellers. Although I now use Pentax DSLR's, I used to use Fujica AX series film cameras. The Fujica viewfinder magnifier will fit my Pentax, so, if you can get a Pentax accessory onto your Canon, you'll probably find the Fujica item will fit as well. The Fujica magnifier has a fairly wide range of dioptre adjustment ... when I need it I find it very useful! That's the brand name, I never can remember it. I bought my 1.3x (or so) Tenpa off eBay for about $35. Quality is reasonably good for a plastic item with elements. The elements are coated and do a good job. I'd have to disagree with all those negative naysayers at Amazon, unless the quality of these items is now unacceptable. It certainly wasn't the case when I bought mine, some 6 or 7 years ago. find out anything about their viewfinder coverage. particularly whether they provide a full viewfinder image? The Canon EP-EX15 II Eyepiece Extender provides a 5/8" (15mm) extension of the cameras eyepiece away from the camera body and reduces the camera's viewfinder magnification by 30%. Also, The lens inside can be replaced by cutout from eyeglasses. Your Canon viewfinder doesn’t have diopter adjustment? Yes, the 50D has a diopter adjustment. I have it one click from max(+) setting. viewfinder field can be viewed through them. Vf diopter should be set at 0 if you wear your glasses. Diopter adjustment will not magnify.